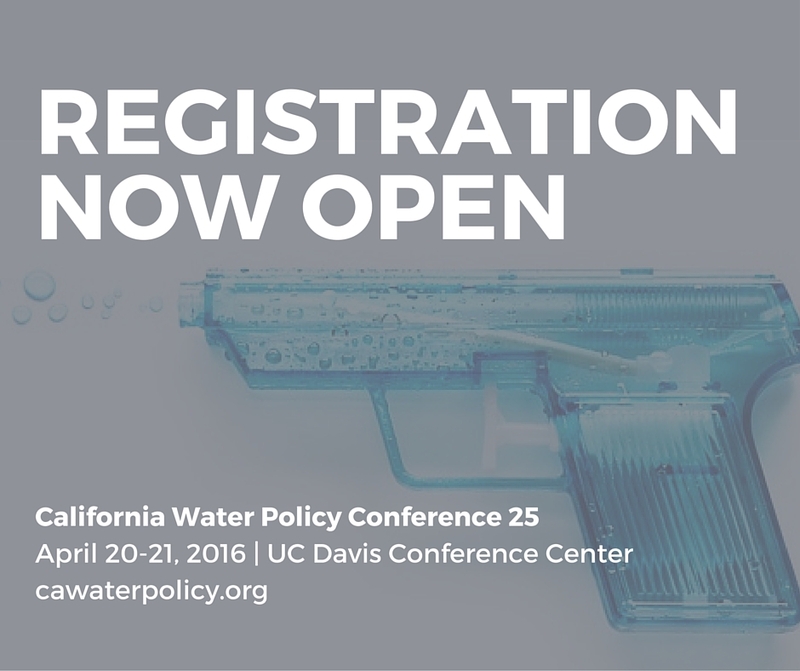 California's premier water forum takes place on April 20-21, 2016 at the UC Davis Conference Center. The 25th annual California Water Policy Conference will take place on April 20-21, 2016 at the UC Davis Conference Center in Davis, California, and registration for the conference is now open. The two-day event brings together leaders from the agricultural, urban and environmental communities to discuss policy issues impacting California’s water. This year’s theme is “Silver Anniversary, No Silver Bullet” reflecting the conference’s ongoing work in building bridges between agriculture, environmental and urban water interests regarding the difficult issues of managing the state’s water resources. Even as the El Nino condition brings rain downpours to parts of the state, years of drought have made an indelible impact on the state’s reservoirs, requiring continued conservation. Conference attendees will hear from the some of the state’s most influential leaders, including California’s water czar Felicia Marcus, chair of the California State Water Resources Control Board, and Glenda Humiston, vice president of agriculture and natural resources at the University of California. Marcus and Humiston are the opening keynote speakers on Wednesday and Thursday, respectively. The conference’s closing speaker will be Dave Wegner, the recently retired staff director for the U.S. House of Representatives’ subcommittee on water, energy and transportation. Authors David and Janet Carle will deliver the luncheon keynote, speaking about their book, Travelling the 38th Parallel: A Water Line Around the World, which took them from Mono Lake to Turkmenistan and the Azores Islands. The conference began as a vision by environmentalist Dorothy Green to bring different perspectives to the same table. Today, the annual event is an established forum drawing participants from around the state who share concern about the state’s water supply and want to find collaborative solutions. Conference attendees will also be able to sign up for a bus tour and overview of new salmon recovery efforts in the Sacramento Valley after the conference closing session, organized by the conference staff and the Sacramento River Watershed Program. Registration for both days of the conference includes continental breakfast each day, lunch on Wednesday and all conference materials. Special rates for students and non-profit organizations are available. Registration is now open for the California Water Policy Conference.